SPI ProHealth provides specialised physical therapy services at world sports championships, tournaments, and private therapy to elite athletes and teams. * Physiotherapists at Pinnacle Performance are managed by SPI ProHealth Director, Philippa Stewart. 1. Please introduce yourself and tell us about your role at Pinnacle Performance. My name is Austin, and I am the Facility Manager and Senior Strength and Conditioning Coach here at Pinnacle Performance, Wan Chai. I work with Tom Summers, who is our Head Strength and Coach and South East Asia Director. I originally came from New Zealand and moved to Australia for my education. I have a tertiary background in clinical exercise physiology, which was much more hospital based. I also worked a fair bit with strength and conditioning in high performance settings including The Queensland Reds rugby team and various performance gyms. 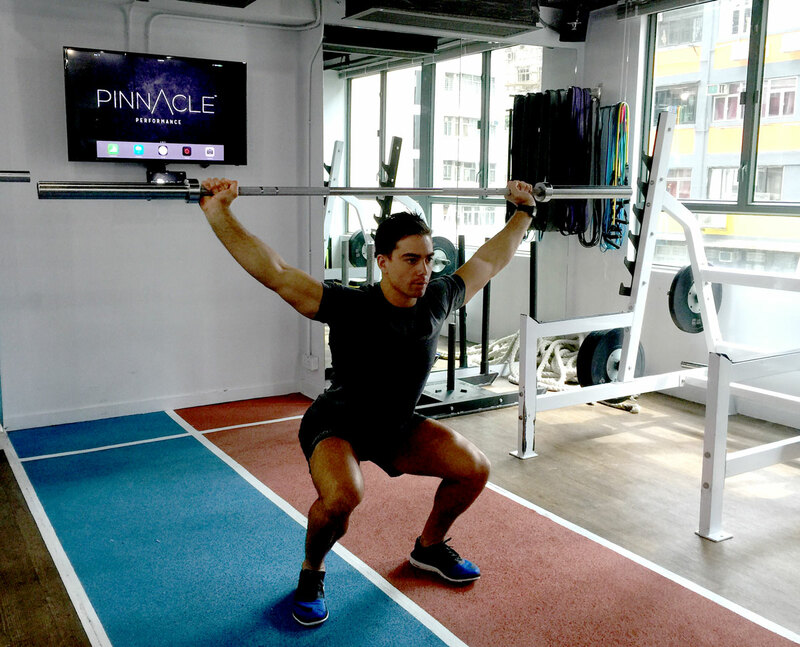 After that, I moved to Hong Kong to pursue rugby and transitioned into a lifestyle and role based around elite coaching for strength and conditioning, which is what Pinnacle is about. 2. Please explain more about the high level training programme Pinnacle Performance offers and is there a baseline method of how to improve physical performance through gym work? Pinnacle focuses on performance as the ultimate end goal. We want to make the most competitive athletes possible, so we follow a set procedure of plan, pursue and perform, whereby we have goals for our clients to follow, to act on and as a result they flourish athletically. Our mantra is ‘Plan, Pursue, Perform’. We utilise this with every athlete and member we work with. It is about setting goals, pursuing efficiently with scientifically sound methods and of course performing at the Pinnacle of our capabilities. Before setting goals, we do an athletic profile of our members, and try to get on the same page in terms of goals. To achieve these goals, we use periodisation and break up programmes into microcycle of 4 weeks to assist staying in line with current literature and the principles of training. We cap our membership to ensure all of our members have optimal access to the facility and our experienced coaches. Each member will also receive a lead coach who will guide them through the appropriate weekly schedule, profiling and also write monthly reviews to discuss loading volume, strength changes and goals. We also work as part of a multi-disciplinary team with physiotherapists in the facility to ensure our athletes are getting comprehensive support. 3. How does the Pinnacle Global Rating work? Why is this used for testing? The Pinnacle Global Rating is 10 quantifiable measurements that provides one with an athletic profile. Each segment is rated on a 1-10 scale, with 10 being the top athletic ability, backed by extensive data that our coaches have collected around the world. This provides the players with an athletic profile that highlights their strengths and weakness, which we will then strive to focus on. Our members and athletes are encouraged to test and update their PGR every 3 months. Their number on the PGR correlates with the level of programming they receive and will be discussed in monthly updates lead by the lead coach. 4. How do Pinnacle trainers keep up with new exercises to motivate clients? All our trainers have to stay current, and luckily here at Pinnacle we have the best. They all have vast amounts of experience and have done extensive amounts of education in their fields. We couple that with constantly using the resources we have to do more research to eventually provide more effective programmes, which in-turn motivates clients to perform better. Our programme templates and periodisation are lead by Head Strength and Conditioning Coach Tom Summers and will be the same across South East Asia. On top of this, the lead coaches will individualise every month to suit the athlete goals, strengths and weaknesses. 5. While working with different teams specialising in various sports, how do you cater the training programmes for these teams? What are some of the difficulties that arise when working with larger groups? How does it differ from working with individuals? It really comes down to backgrounds of the coaches. Each team will have a Lead Strength and Conditioning coach, who provides programmes that are tailored to each sport. Simultaneously, they will look at the evidence of their current exercises or use other coaches experience. We have CPD networks that facilitate continual improvements as well. To deal with larger teams, we use more of our internationally accredited coaches, which is important as we pride ourselves on keeping the coach and facility to athlete ratio quite low. Elite athletes are usually self-motivated when wanting to get better results, but often they need professional engagement to continue improving. When working with individuals, we tend to partner them with one lead coach who is available to answer any of their questions whenever needed and provide them with a step-by-step approach to reach their goals. Furthermore, we hold them accountable for their performance in their monthly reviews and help them with micro, short, mid and long term goals. 6. How does a strength and conditioning coach work alongside a sports coach and does sports physiotherapy fit into a S&C programme? If so, how? Usually, when travelling for tours, there will be a sports doctor, a physiotherapist and a strength and conditioning coach. The strength and conditioning coach will take charge of warm-ups and cool downs, and work alongside the physiotherapist to prevent and manage injuries. The sports doctor takes care of the rest, and we cohesively manage the athletes during the tours. When we are back home, the focus generally comes back to the strength and conditioning programmes and coach led training sessions. We use a combination of communicative systems to ensure everyone is kept on the same page. Our physiotherapists and coaches use a weekly update log which is accessible to all management staff. The players have regular testing and profiling from the coaches, nutritionists and physiotherapists. This ensures management have a clear picture of each athlete and their current/ past situation. We take profiling and monitoring very important because the test-retest model forms the basis of what we do. 7. Please tell us the benefits of providing physiotherapy services for your gym clients? There are massive benefits on providing physiotherapy, both to elite athletes and general members. Physiotherapists work side by side coaches to prevent and manage injuries, feed vital information to the other team members to ensure that athletes perform at a maximum level. It is important the communication between the allied professionals is in-house and on key as programmes can be modified instantaneously and with two or more specialists. As a member’s injury is managed and monitored, the communication and progression of the programming and coaching can be modified alongside. This is an important feature of our multidisciplinary team and something we take pride in offering. 8. What is the ‘return-to-play’ fitness programme? At Pinnacle, we provide an individualised programme that helps athletes gradually return back to peak performance after injury. It’s based on different sets of incremental tiers, that is reinforced by goals that each player has to follow before they reach their maximum ability. We have a number of different protocols developed by our internationally accredited physiotherapists and coaches. They range from specific, evidence based ACL rehabilitation protocols to shoulder impingement and movement competency based rehab. Our team will continue to monitor and progress as they go to ensure the member returns to sport efficiently but at the appropriate level. 9. Are there any additional challenges when dealing with Junior athletes as opposed to accomplished athletes? For young athletes, we look at baseline patterns and really try to apply the same mantra of ‘Plan, Pursue and Perform’. They may not be as strong as the older players, but conditioning them with basic exercise patterns and movement competencies is where we focus on here. It is all about long term athlete development (LTAD) in a very nurturing and monitored environment. Of course, our guidelines are scientifically based and we monitor along with all other youth athletes with our Pinnacle Youth Rating (PYR). It is crucial to get junior athletes into the facility with appropriate, progressive and evidence based programming. This will form the basis of many motor patterns in the years to come.